This biscotti recipe is from AcquerelloÂ – the restaurant in San Francisco where I did my externship for school. I used to make 3 large batches per week. The waiters would bring them out to customers along w/ their check… I guess it made the price of the meal more palatable (ha! ).Â I reduced the original recipe by 3/4ths – I alsoÂ substituted the lemon zest w/ orange zest and used hazelnuts instead of sliced almonds (I forgot to add the nuts to the batter for this batch… oh well, there’s always next time, but I wasÂ soÂ looking forward to the crunchiness and flavor of the hazelnuts!) By the way, if you’re wondering, yes, I did eat the whole plateful of biscotti (not!). Â This biscotti recipe is from AcquerelloÂ – the restaurant in San Francisco where I did my externship for school. I used to make 3 large batches per week. The waiters would bring them out to customers along w/ their check… I guess it made the price of the meal more palatable (ha! ).Â I reduced the original recipe by 3/4ths – I alsoÂ substituted the lemon zest w/ orange zest and used hazelnuts instead of sliced almonds (I forgot to add the nuts to the batter for this batch… oh well, there’s always next time, but I wasÂ soÂ looking forward to the crunchiness and flavor of the hazelnuts!) By the way, if you’re wondering, yes, I did eat the whole plateful of biscotti (not!). Side note: The plateÂ in the photos is over 300 years old. According to my dad it (along w/ the rest of a set of dishes) was oneÂ theÂ fewÂ of his belongingsÂ that survived the bombings in Milan, Italy during World War II. The apartment building he lived in was destroyed, but the dishes were in the sub-basement and miraculouslyÂ didn’t get broken! If you zoom in you can see the hand-paintedÂ flowers on the plate. The artist also painted flower buds over any small defects in the porcelain. 1) Combine butter, sugar, almond paste, and vanilla in food processor and cream until smooth. 2) Place eggs into a bowl and add orange zest, reserve. 3) Combine all other dry ingredients (except hazelnuts) in a large bowl and sift. Place hazelnuts into sifted ingredients and reserve. 5) Add all the dry ingredients and mix until dough just comes together. Test texture of dough – if too dry add another egg, if too wet add a bit more flour. 6) Preheat oven to 350 degrees F.
7) Remove dough from processor and place onto a lightly floured surface. Work dough lightly into a brick and cut in half. Roll out both pieces into round logs about 12 inches in length -Â add flour to surface as needed to keep logs from stickingÂ (the dough is loose and sticky so having flour on your hands will help during this step). 8) Place logs onto parchment paper lined sheet pans that have been sprayed w/ oil to keep parchment paper in place (one log per pan if using half sheet pans). 9) Place sheet pans in oven and bake for 30Â – 35 minutes or until golden brown. RotateÂ pans top to bottom and back to front about halfway throughÂ for even baking. 11) Place slices back onto sheet pans and bake for an additional 20 – 25 minutes until biscotti are just starting to brown (be careful to not over bake at this stage or biscotti will become too hard). Rotate pans again during this second baking. 12) Remove pans from oven and allow biscotti to cool completely before storing in an airtight container. 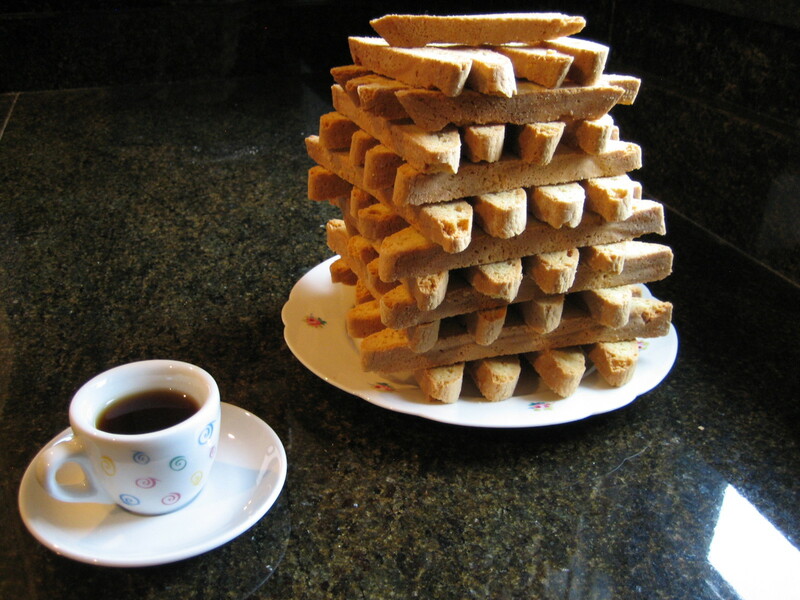 13) Enjoy your fresh biscotti w/ coffee or tea while visiting w/ friends, and remember to bring them some for snacking on later! The first that, like mine includes the important ingredient almond paste! I learned to bake biscotti from an old lady in Tuscany. Important point: use whole almonds, toasted. Try this, you won’t regret it. Thanks Ingela! Next time I make biscotti I wil have to try the whole toasted almonds along w/ hazelnuts.